At first glance, the Honor 7A looks like one of the best budget phones you can buy. It has specs similar to a Moto G6 Play but costs £20 less. So the 7A should be great, right? We thought it would be, but sadly it's not because its performance is bizarrely slow. Honor may be able to improve this with future software updates, but given how compromised it feels right now, just play safe and buy a Moto G6 Play. What's frustrating about the 7A's slow performance is that to look at and to feel, it's a perfectly solid phone that looks like a much pricier handset. Its shell is plastic but has a light sparkle to its finish that looks like aluminium from a distance (the sides are aluminium proper, though). 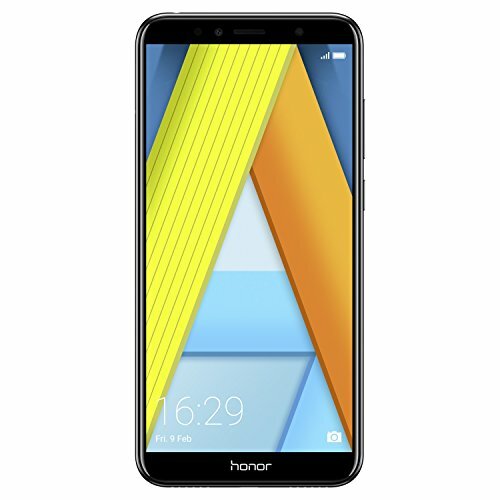 It's not fancy or flash, but there's no obvious giveaway the Honor 7A is a true entry-level phone until you get your hands on it. At 7.8mm thick it's significantly slimmer than the Moto G6 phones, so side-by-side the Honor does look the more appealing. Get closer and you'll see some of the usual budget trade-offs though. The Honor is not water-resistant, and it doesn't use Gorilla Glass for its front display protection. The Honor 7A does have a fingerprint scanner, though. It's a little round pad on the back, like most of the Honor designs. It performs ok, but is a little slower than you'll find from the best on market. It's slightly too high up on the phone's back for comfort too - as we said of the Asus Zenfone 5 - but you'll get used to that after a few days. If the Honor 7A has a claim to fame, it's to being just about the cheapest 18:9 aspect ratio screen phone you can get (well, outside of a Chinese brand that would never make it to the average UK high street store). It looks much taller than the 16:9 screen phone that's probably in your pocket right now, and it will probably fit better in your hand too. At 5.7-inches, handling the Honor 7A is much like using a normal 5-inch phone, even if it sounds like one far larger. At this affordable price point, the screen resolution isn't the hghest going. But at HD+ it's not going to break your eyeballs - it's just much lower than the Full HD+ panels you'll see in slightly more expensive 18:9 models. Can you notice the difference? Yes, sure. Look reasonably close and you can see slight pixellation in fonts. It's not an ultra-pristine screen, but it's not the end of the world. On the downside this screen doesn't have an effective oleophobic coating, which would helps make fingerprints and oil from your skin less of an issue. It's quite apparent: at times a little petrol-like slick of oil is left on the screen. And no, we've not just been eating packet after packet of crisps while reviewing the Honor 7A. On the upside, however, the screen's colour is fairly vivid, contrast is fine for an LCD, and brightness is just about powerful enough to cope with sunny days. Side-by-side the Moto G6 Plus has slightly better colour tone, but perhaps mainly because it offers greater customisation within its settings. So the design and screen are more-or-less fine, easily comparable or better than other £140 phones. The Honor 7A's problems really arise in the software. We already know the Snapdragon 430 used in the Honor 7A is powerful enough to make its operating system run very well (the Moto G6 Play proved this). And we've come to like much of Huawei's EMUI 8.0 software re-skin over time too. The problem seems to be the combination of these things: Android 8.0 and EMUI 8.0 software horribly in the Honor 7A. Simple apps can sometimes take several seconds to load, and quite often the phone simply hangs on a black screen as it transitions between apps. We half thought the phone's launch firmware radically downgraded CPU power in order to save battery life. However, that doesn't really seem to pan out when a high-end game like Asphalt 8 runs just fine. That the performance problems are rooted in the day-to-day jumping between apps suggests this is more likely to be a RAM handling issue. RAM is the stuff that greases the cogs of any phone, tablet or laptop. Run out and things turn bad very quickly. The Honor 7A has 2GB RAM – not loads but normally enough to run Android well – so we're wondering if the EMUI setup is holding onto too much of this space. The potential good news is that this can, in theory, all be fixed. Honor can get in there, see what's wrong and sort it out. However, we can only review the phone as it is now. And having this as a starting point is not good. We've even attempted a couple of factory resets to see if that would solve the problem, but no dice. The 7A's camera is affected by the performance issues too. It crashes at times, and shutter lag is noticeable. Solider on, though, and the Honor 7A can take some fairly nice shots in daylight. It has a 13-megapixel rear camera with an f/2.2 aperture lens. While you can take decent photos in daylight, the results aren't quite as good as those of the Moto G6, which preserves highlights and retrieves shadow detail more effectively. And the Moto's colours look a little warmer and pleasant to our eyes too. Like just about every low-end phone, the Honor 7A can't take great shots at night either. Very dark scenes will end up looking too dark, and when there is a bit of light with which to work, the noise reduction processing leaves shots looking soft. Video capture is basic too. You can only shoot at up to Full HD resolution, but the Honor does not crop into the view to software-stabilise the footage. The Honor 7A also has what's become the baseline standard for batteries in 18:9 phones: a 3000mAh battery, which is a decent capacity for a phone of this spec and screen scale. It delivers solid performance, but comes up short of being a particularly note-worthy endurance. The phone will last a full day unless you drive it quite hard. The 7A also has a Micro-USB socket rather than the newer USB-C, so there's no fast-charging here. However, if you're looking at the Honor 7A your old phone probably has one of these ports anyway, so that might leave you with a spare and useful cable. Neither of these little issues are a surprise given the price, but are two more reasons to spend a bit more and buy a Motorola Moto G6 Play. It uses Micro-USB too, but with fast-charging tech. Its battery also lasts a lot longer thanks to its higher capacity battery (it's 33 per cent more capacious). Finally, the Honor 7A's speaker is actually fairly loud. It uses a single driver on the bottom and can compete with ambient noise well for a cheap phone. However, its treble does become a little brash at max volume and there's just the tiniest hint of bass. Start using it, however, and its performance undoes much of its good points. It's just too slow. And the Moto G6 Play is so much better. All we can hope is that the Honor will improve with software updates - as so many of its phones, like the Honor 10 and View 10, are great - but we'd rather not bank on it and, therefore, this budget handset is one to avoid right now. It may be slightly more expensive than the Honor, but the G6 Play is better in just about every respect. General performance and battery life are highlights of this budget star.